When Jess and I get together, some sort of baking is almost inevitably going to occur (long-time readers may recall a certain Boston Dessert Week), and my most recent trip to Boston was no exception. We contemplated our choices and pondered the possibilities – coconut or chocolate? Maybe something fruity? Or how about something spicy? We settled on a Gingerbread Cake with Cinnamon Cream Cheese Frosting because a) ‘tis the season; b) Jess has never had gingerbread before; which is compounded by c) nor has she cooked with molasses – one of my favorite ingredients!!! We found our recipe on Gojee (oh the wide wide world of food/recipe aps) and it turned out quite well. 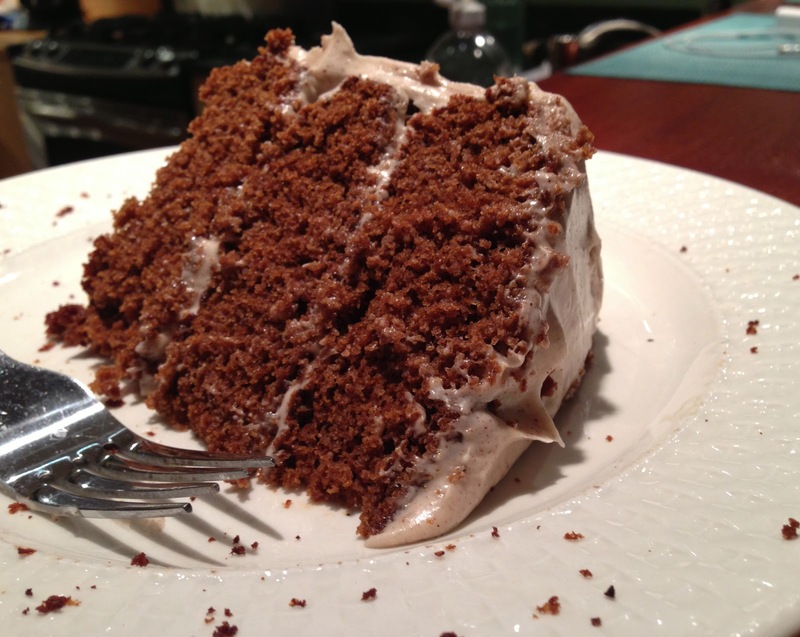 The original recipe was for cupcakes, but we made it in cake form and it worked perfectly. 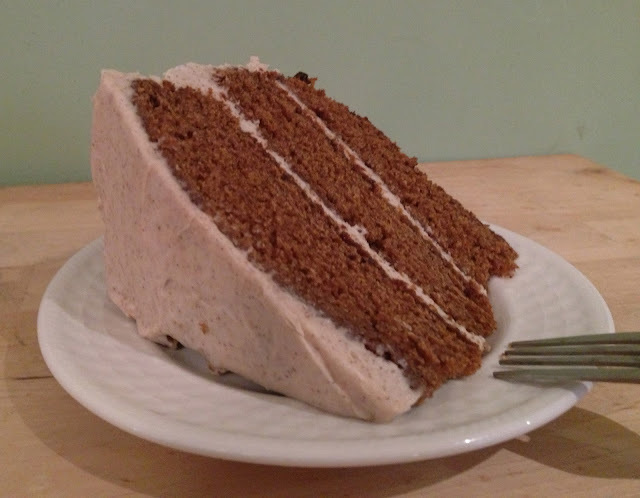 Unlike many gingerbreads, this isn’t dense at all – it truly is a gingerbread cake recipe. And the frosting, oh the frosting. Cinnamon Cream Cheese need I say more? Swoon. I usually prefer to bake solo (as in, other people can watch, but only one cook at a time! ), but Jess is one of the few (only?) people I can actually bake with. We work well together, trading off measuring and mixing and sticking our fingers in the batter and cleaning up as we go. 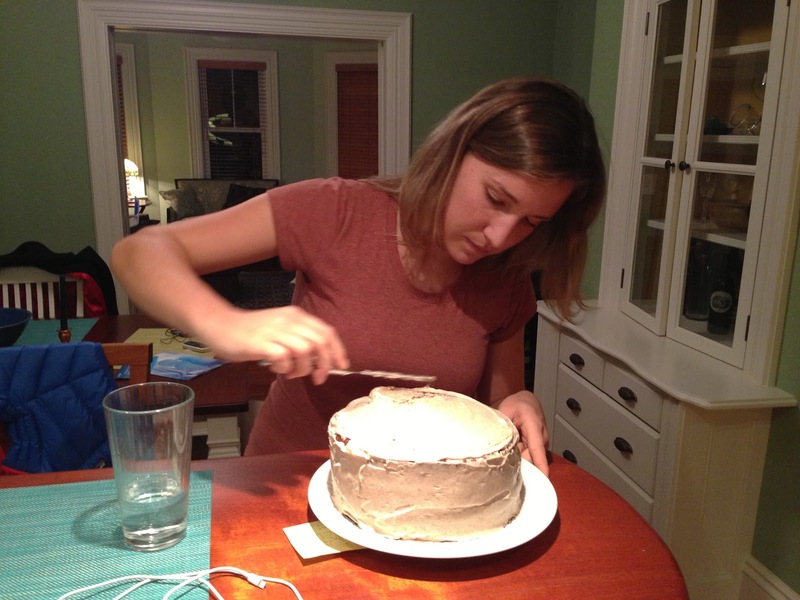 She likes mixing the frosting (oh hello aforementioned fingers), while I prefer full control over the frosting process. After baking and cooling and frosting, we let our glorious cake solidify in the fridge for a grand total of 30 minutes before we couldn’t wait anymore…cake time! Oh and a serving suggestion: scoop some pumpkin ice cream on top (not pictured...we ate it too fast). Trust me. This cake would be GREAT to bring to a holiday party, maybe decorated with some red and green sprinkles or a sprig of holly? Preheat the oven to 350. Spray and flour (very thoroughly! Our cakes stuck) three 8-inch round cake pans. Mix together the dry ingredients except for the brown sugar and set aside. Cream the brown sugar and butter together in a mixer for 3-5 minutes or until light and fluffy. Add the eggs one at a time, beating well after each addition. Add the molasses, mixing until well-incorporated. 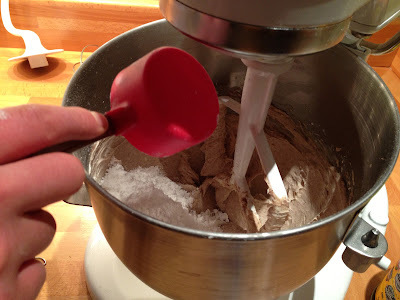 Alternately add one third of the dry ingredients, one third of the water, etc, mixing after each addition. The batter will be thin. Evenly divide batter between pans. Bake for 20-25 minutes or until a toothpick or knife inserted into the center comes out clean. Transfer to a rack to cool for 10 minutes, then run a knife around the edge, tip the cakes out, and finish cooling on wire racks. Place all ingredients in a mixer fitted with the paddle attachment and beat until well-combined. 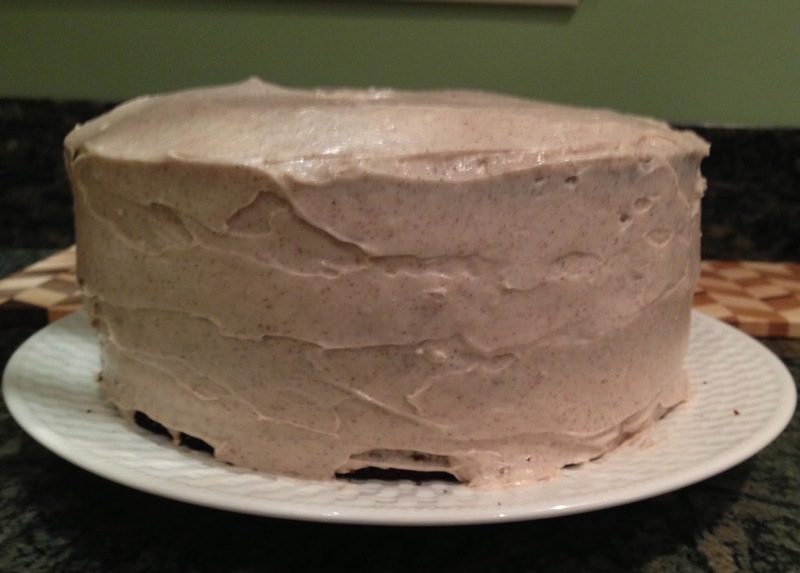 Then, when your cake is completely cooled, frost it one layer at a time (well duh). Enjoy! Weekend Report: Long Weekend in Boston!